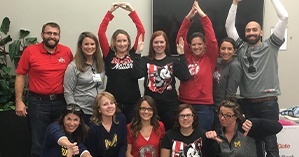 In the spirit of the Ohio State vs. Michigan game, Ohioans staff brought in donations for the Seagate Food Bank. We collected a total of 677 lbs. of food, clothing, and toiletries! These items are put together into baskets to deliver the week of Christmas to homes in the community including a number of veterans that are in need for the holidays. In the end, the OSU food bank donations won! Previous Previous post: November is National Family Caregivers Month!